From water skiing to skydiving to bungee jumping and more, we are your complete guide to the best extreme sports in MO. No matter what you are looking for, you will find it in our list. We have all of the Missouri extreme sports you could possibly think of. 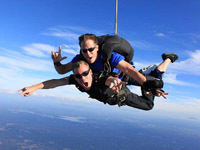 If you want to go sky diving in Missouri, we are your complete guide to the best locations for that. Be adventurous and go skydiving in MO!